Management is very supportive and helpful. The HoD was vert friendly and knew each one of us personally. I can never forget my experience there. Atmosphere is so cool and it offers lots of mind blowing areas and a good canteen, well spaced parking lot and the college situated in the middle of Nagpur city so the transportation is so easily available . only 3 km railway Station and 1 km bus stand. I feel very enthusiastic in Hislop college due to its great environment. Hislop college Motto is"Green Hislop Clean Hislop" Besides this free Wi-Fi facility is available for students. There are many trees and plants available in college premise which makes our surrounding environment cool. Hislop college is technologically superior as many latest instruments are available in college. I am truly enjoying my college life in Hislop college. I am enjoying my post graduation college life to its fullest . Our college provides free Wi-Fi for all students because our college is technologically superior. Hislop college Motto is " Green Hislop Clean Hislop". I am enjoying my college life to its fullest. 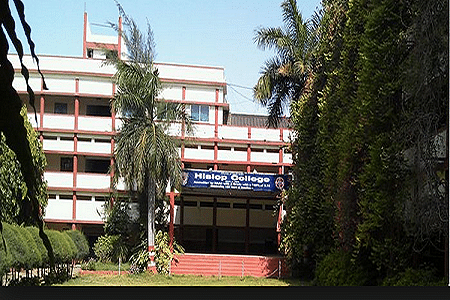 The oldest and eminent college in Nagpur, Hislop College has credit of India’s 9th Prime Minister and several famous writers and physicist. It has now 132 years long standing history in educating the students of central India. This is an Arts and Science College and affiliated with the University of Nagpur. This is a co-educational institution having junior and senior college conducting Graduation and Post Graduation courses. It has 5 language courses, 33 Science courses, the commerce course that includes computer course and in Arts it has a total of 10 courses. All of this function is different department and are having experienced faculties. Why to join Hislop College? Computerized administrative office with many counters,Sheltered Botanical Garden,power gym, modern girls’ hostel, vast library with 75,000 books and online library, multimedia equipped auditorium makes the institude a technologically sound one. It has lab facilities for Chemistry, English, Statistics, Zoology and Biotechnology. It also comprises of vast playground. There is a friendly sit and dine outdoor cafeteria in this college. The state grants support for the weaker sections of society. These students are eligible for availing financial assistance from this college. The college also provides students railway concession for outstation students for traveling on trains. With the help of the placement cell, the students can get guidance from their seniors about the current employment scene. This valuable support from the placement cell will ensure students of being in safe hands. I have scored 71% in 12th boards (science stream) with 93 marks in English subject. I wanted to ask if I can get admission in Hislop College Nagpur ( I want to pursue BA ). Thanks. Hi Sneha, The Applicants who have completed HSC/ 10 2 or its equivalent qualifying examination from a recognized board are considered eligible for admission to B.a course.The Selection of the candidate for admission is done on the basis of their merit in the qualifying examination. I am studying in 1st year BA civil services in different university so I wanted to know if I could get admission in 1st year in your college ? Hope of your earlier response . "I feel very enthusiastic in Hislop college due to its great environment." I don't give any entrance exam for admission. I got 75% marks in 12th science stream and I directly got admission in Hislop college. Yes there was an interview process to test our behaviour and other skills. "I am enjoying my post graduation college life to its fullest ." I have recently passed out from Hislop college doing graduation with securing 73% . So taking admission in Hislop college was not too difficult task. There was no entrance exam and no interview. I have choose M.Sc in Physics because I love physics subject very much. I gave all the entrance exams but unfortunately did not get admission in any top college outside nagpur.. Therefore I opted a top college in nagpur.. They do not take any entrance exam but you need to have good percentage in bsc. I will suggest you should pursue biotechnology from out of nagpur only.